It is an impressive fact that Nashville, Tennessee, my home, is the only city in the world that has reinterpretations of two epic temples from antiquity. Both are among the finest in existence. The other is a $55 million 2,200-foot long rod laid out and growing on 19 acres at the base of the Tennessee State Capitol mound. By a masterstroke of synchronicity, it is patterned like the world axis, Mount Meru, the cosmic pillar or axis at the center of the world ascended by Buddha, and known throughout the ages as the model for all Trees of Life. Though constructed one hundred years apart these temples belong together. Their myths and symbols are interconnected. They are both ceremonial centers, power points of peace and community gathering that could play an essential role in the drama of our world in coming years. Myths require reinterpretation to stay alive. Athena and the Cosmic Axis are alive and well in Music City. There may be a very provocative reason for this. In their book, Talisman: Sacred Cities, Secret Faith, Graham Hancock and Robert Bauval soundly document that the architecture of great cities such as Paris and Washington DC are secretly being used by Hermeticists, Masons and alchemists to transmit hidden knowledge from antiquity. They endowed these cities with spiritual power through architecture. The designers of these ‘light centers’ (my term) used what the French alchemist Schwaller De Lubicz called “the Symbolique”, the use of mystical architecture as a means of knowledge transmission. Books, these craftsmen know, can be burned. Knowledge encoded in the shapes (geometry) and symbols of various mystical buildings and other constructions can stand for centuries. It’s a way of keeping myths alive and hiding secrets in plain sight that counts on the total blindness of the average individual to the esoteric language of symbols. Hancock and Bauval claim the secrets these ‘illumined ones’ are transmitting originated with Hermes, the Greek name for the legendary instructor, prophet and scribe deified by the Egyptians as the god Thoth and known to the Hebrews as Enoch, who was “snatched” into heaven by a whirlwind and (star) walked with God. The far older Sumerians called him Lord Enki, the god of smithcraft and alchemy, who led the Anunnaki, the ‘fifty gods who came to earth from heaven’. Z. Sitchin says he was the model for the Serpent of Wisdom of Genesis and is considered the bearer of mystic secrets. As I will show, Nashville’s talismans have deep connections to Enki and the Anunnaki. They clearly point to Nashville’s Hermetic nature. 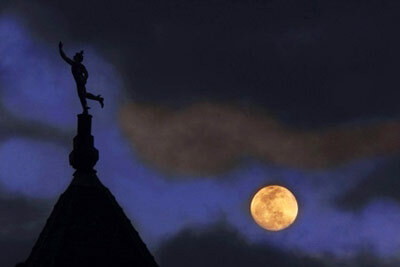 In fact, understood in its spiritual sense Nashville may be the ultimate Hermetic city light center. 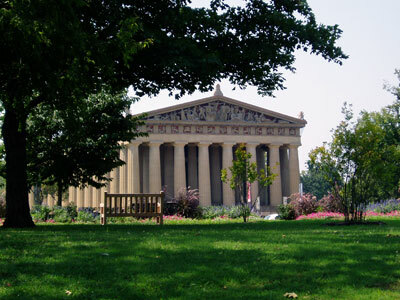 Nashville is called “the Athens of the South.” Her life-size copy of the Parthenon was constructed in 1897 to celebrate Tennessee’s Centennial and rebuilt in the 1920s. Inside is sculptor Alan LeQuire’s masterpiece commissioned in 1982, a 41-foot, 10-inch tall statue of the lost Athena-Parthenos. She’s the tallest indoor sculpture in the Western world. Considered to be the Serpent’s Eve reborn and exalted after the Deluge THE SINKING OF AT L A N T I S, the immortal Athena stands with her holy rod of power and spear in her hand. Her giant serpent rises at her feet, the protector of the acropOlis ‘place of secrets’ at Athens. In Greek myth the god of smithcraft/alchemy, Hephaestus (the Sumerian Enki), crafted this rod for Athena. The East Frieze on Athena’s Parthenon, it is claimed, contained all the elements of Plato’s Atlantis texts and suggests that the Parthenon was built to commemorate both Athena and Hephaestus Enki, since they both championed the Athenians in the epic War between Athens and Atlantis. 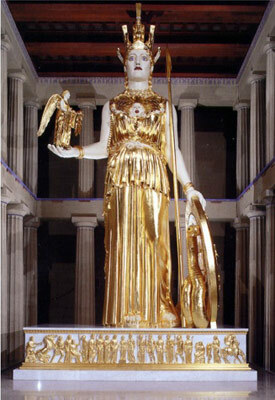 Clothed in leaves of 23.75-karat gold leaf in 2002, Nashville’s golden goddess replicates what historians believe the original statue of Athena looked like. She is stunning, even bedazzling to behold (when was the last time you stood in front of so much gold?). It’s breathtaking when they open the 8 ton bronze doors to her temple and let the Sun shine in. Significantly, Athena beams at a 2,200-foot long ‘rod’ that has been growing since 1996 in front of the north slope of the artificially tiered mound upon which sits the State Capitol, a few short miles away. 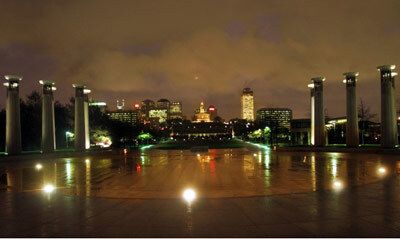 Nashville’s Bicentennial Mall radiates an eerie glow at night. When the Mall was opened in 1996 it was proclaimed the sister complex to the National Mall in Washington DC; a fact which sends Masonic bells ringing for some. Until I came along in 1999, no one noticed the uncanny similarity of its design to a second century drawing of Enki’s mystical Meru rod. Both designs feature a circular platform upon which sits a tapering rod topped by a triangular shape. While Kem Hinton, the architect who led the Mall’s design team, told me he does not see a similarity in the designs, it is plainly evident to many with what he calls ‘untrained’ eyes. The Meru diagram is a mandala, a mnemonic device, designed to guide the neophyte into meditation and communion. The Meru rod resembles an antenna because that’s what Meru myth says it was. It is claimed that the immortals or the Great Spirit (symbolized in Judaism by a Serpent of Wisdom) lived at Meru because of the protecting power of the healing universal life force energy – the Key of Life – emitted (or transmitted) by Meru. The triangular apex at the top of the pillar symbolizes Shambhala, the dwelling of the gods. Meru is symbolic of the antenna-like beacon or link the Dur~An~Ki Sitchin says was used by the Anunnaki for sending messages heavenward and as a ceremonial center for state visits of Anu, Enki’s father, to Su-Meru. As I tell in my book City of Peace, I chanced upon Nashville’s Mall-Meru cross in 1999 while researching FDRs quest for the secrets of Jesus in Shambhala, the apex of Meru, in Mongolia in 1934. I followed a clue in a coded letter sent by Henry A. Wallace, FDR’s Secretary of Agriculture and partner in this ‘Grail quest’, to the famed guru Nicholas Roerich, the third ‘wise man’ in this trinity. It suggested that Nashville, TN was a possible repository for the results of their investigation. The key clue that led me to the Mall site was Wallace’s mention of a ‘sacred casket’ or coffin and a location in America marked by ‘seven stars under three stars’. Tennessee’s state flag is the only flag in the union that has only three stars. According to state archaeologists, the Mall site has been used as a ceremonial center since 900 AD when the Mississippian culture built a ceremonial mound royal grave just seventy yards away. “Vast numbers” of bodies are interred here. This makes this site a giant coffin. Hermes/Thoth’s ‘As above. So below’ law is clearly evidenced by these place names and the early usage of the Mall site as a burial ground necropolis. Since 2000, I’ve walked the Mall and the Parthenon with thousands of people, including artists, musicians, engineers, and shamans. All have been astounded by the elements of their craft intricately woven into the design of this amazing rod. 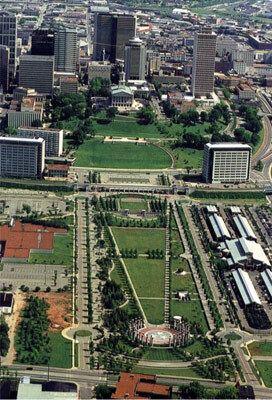 If you’re one of the over one million people who visit the Bicentennial Capitol Mall annually you may only see the grand works of stone and trees, because those who visit normally look at it from the outside looking in. However, the stone works are actually Hermetic mystery symbols. It’s a codebook that even features a billion year timeline that goes back to the creation of this world! The rod portion of the Mall has seven springs running beneath it. (The cosmic Tree of Life is always rooted in water.) Each of the body’s seven chakras is perfectly marked with appropriate symbolism at the Mall. It is truly a Seven-Gated Magician’s Rod fitting of Hermes. This living temple is lined with oak trees, which means it fits the biblical definition of an Ashera. The Hebrew word ashera, rendered grove in the Authorized Version of the Bible refers to a living or wooden pillar or a grove of trees of the Anunnaki goddess, Is-Tara or Astarte. Ashi is the Sumerian root for ‘heal’. These healing pillars of worship, where the Great Wise Serpent/Spirit (Enki?) manifested, were forbidden by the Jewish patriarchy. 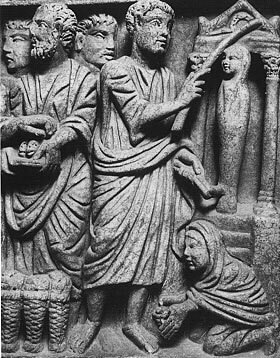 The fact that the ashera was the place of worship of Ishtar is integral to decoding the Mall. Ishtar is another name for Inanna, a probable precursor to Athena. Both goddesses were portrayed with a rod and serpent. 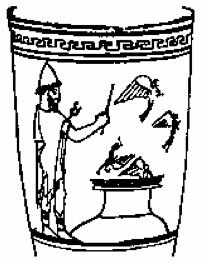 Further, Innana’s father was Enki (Athena’s Hephaestus)! It is my belief that Athena’s rod is a symbol for Hephaestus’s (Lord Enki’s) Meru rod and a variation of it is growing near her temple in downtown Nashville. Supposedly, it all happened by coincidence. Stranger synchronicities have happened in mythology, I just can’t think of any off the top of my head. There is more to connect Nashville’s Mall to Meru myth. 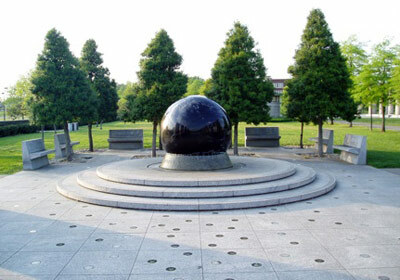 For example, the eerie WW II Memorial temple at the Mall features an 18,161-pound black granite globe spinning on 1/8 inch of water. With the Sun shining upon its black mirror-like surface it becomes a ‘Night Sun’ or a ‘Black Sun,’ the symbol for an eclipses, but also for the innermost occult circle of the Nazis, the ‘Order of the Black Sun’. Strangely, the Germans built this black mirror. This is simply amazing. According to W.H. Muller in his book ‘Polaria’, “the Black Sun is the Beacon of the World-Mountain (Meru) spinning in the Space of Spirit’.” Now that is just plain spooky. 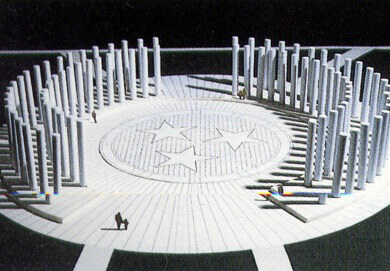 At the apex of the Bicentennial Mall is a Stonehenge-like stone circle called the Court of Three Stars. Two concentric rings of (sacred) 50 twenty-five foot tall solid limestone pillars form its ‘C’ shape. The 4-foot diameter, Egyptian djed-like pillars hold 95 bells of different pitches (one for each county in Tennessee) that form a musical instrument called a carillon – the largest in the world. The 95 bells resonate with a 96th bell located beside the Capitol. Coincidentally, the Land of Shambhala, with Meru as its center, has 96 principalities. Now, the biblical name for a circle of upright stone pillars (usually 12) is gilgal. This was the place where Elijah ascended in a whirlwind. It is the root of Gulgotha, ‘the place of the skull’, where Jesus was ‘crucified’. Granite is considered a masculine stone. Limestone, which is associated with water, is considered to have feminine properties. Together, the granite floor and limestone pillars charge the Court of Three Stars with positive and negative polarity, just like an electrical circuit. Etched into this granite ‘tuner’ is a trinity of 15-foot wide pentacles – a protective symbol known as Solomon’s Seal… and the star of Ishtar or Athena. At their center is the logo for Tennessee, a triceps, a triangle or trinity formed of three diamonds. One of the most powerful ancient symbols, the triceps is an ancient Nordic symbol of divine force, power and protection. It symbolizes the A U M trinity. It matches the alchemical symbol called the caput mortum, the skull or death’s head , the starting point for Enki’s alchemical work of transforming a human – the impure or base metal – into pure gold. Driven into the exact center, “the Holy of Holies,” of this magnificent acoustic chamber – or satellite dish – is an iron rod. When we stand on it and make a sound we experience an intense reverberation (almost as if we’re speaking directly into Enki’s ear). Stone circles have appeared as markers of places of power. The stone circle atop the rod in Music City clearly is an instrument of divine force, power and protection that qualifies this site as Hermetic. When we add all these symbols together, they point to one overwhelming conjecture. The Nashville Mall is a mandala, a(n) Anunnaki? 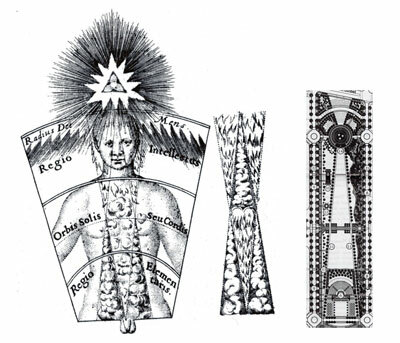 place of initiation into the means to operate our inner Tree of Life Meru Rod and to connect with the divine realm of Enki, Thoth, Hermes, and Enoch. Nashville is, unquestionably, a city whose talismanic symbols place it in the Hermetic big leagues along with Washington DC and Paris. Perhaps it is time for Nashville’s secrets to ring. This brings up a very profound point. Students of Judeo-Christian prophecy claim that the ‘End Time’ will see the appearance of Revelation 12’s ‘woman clothed with the sun’ who bears a child who rules with a rod of iron. It will also see the return of the prophet Elijah (through the gilgal, I presume) and the rebuilding of Solomon’s Temple, an act that is instrumental in the creation of the New Thousand Years of Peace. Is Jesus, the Fisherman, raising Lazarus with a fishing pole or the Meru rod? It is thought that Elijah will return the Rod of Jesse – the rod signifying his power, a branch from the Tree of Life – to the Messiah, who will be seated on the Mercy Seat in the Holy of Holies of Solomon’s Temple on Mount Moriah (or is it Meru?). He will replace the Ark of the Covenant that had symbolized him, in the place where God is believed to have first walked with Adam and Eve, the Garden of Eden. Just as a branch from the Tree of Life was kept before the Ark, he will set the Rod of God before himself on the Throne of God, where the Tree of Life had grown in the Garden of Eden. Could Revelation’s mysterious woman clothed with the sun be the gold (sun) clad Athena? Has the rod of destiny, in the form of a 2,200-foot long living temple, manifested in Nashville? Is Nashville the ultimate light center? Come to Nashville, take a walk with me, and see for yourself. Very informative article. I now want to go to Nashville. This type of symbolism is very intriguing to me. Thanks. I live in Nashville and I’ve always know there’s an extra beauty and mystic about it. Thank you for the enlightenment on that. Is there any connection between the Parthenon and masonic organization? I just happened to see this article. I met William many years ago (1992). I’m amazed at all the synchronicities he points out. Very interesting and it explains much about the energy of this ever changing city which I’ve called home for many decades. Thank you for this wonderful information. I live in Lebanon TN and had no idea what was right down the road. Also , the 1990’s built at&t ” Batman ” building ushered in the new “hipster” era in Nashville I believe . Nashville has changed drastically since then . Symbols are powerful and unconsciously attract people with alternative beliefs. Detroit is another city with strange architecture symbolism . Things didn’t work out too well for them so let’s hope the Nash doesn’t take a nose dive. This August 21st event goes dead center over Nashville. Goes along with a timing, marker. Events unfold, at an alarming rate, disarming the misaligned. 100% Solar Eclipse, Is this the one? An axis or change in the weather of events, and balance towards the other side. Gilgal reminds me if Gilgamesh. It occurs in the early afternoon. A german Black Sun, very interesting. Website indicates exact trajectory of moons shadow or black Sun. Thank you wonderful information and ancient alchemical hermetic connections! I met you in Nee Haven years ago at an event with Gloria Amendola! Your information then was mind blowing! Thank you for staying on your path and helping us all understand this amazing ancient information contained in these architectural sites!